This entry was posted in Uncategorised on 26th August 2014 by Kathleen. Really really liked this. 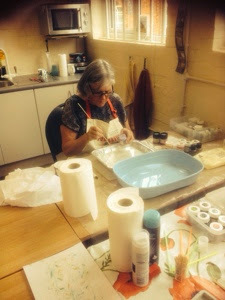 What a great way to have some creative fun practicing your free motion embroidery whilst quilting the project at the same time.as you can see it has got me just a little hooked. This entry was posted in Machine Embroidery, Uncategorised on 21st August 2014 by Kathleen. 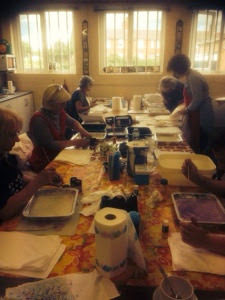 The lovely John joined the monthly printing and painting fabrics class ho day at Tudorrosepatchwork patchwork shop. Here he is so engrossed in dispersing his design across the fabric that he hadn’t noticed me doing pics . This is great run for anyone to do. 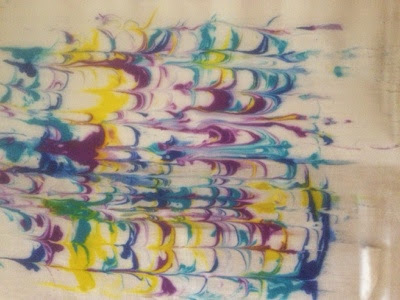 Just draw and colour in on fabric with the sharpies , then disperse the inks out by dropping drops of the alcohol in to the centre or on certain areas to make the colours run in each other. This entry was posted in Sharpies and Alcohol, Uncategorised on 20th July 2014 by Kathleen. 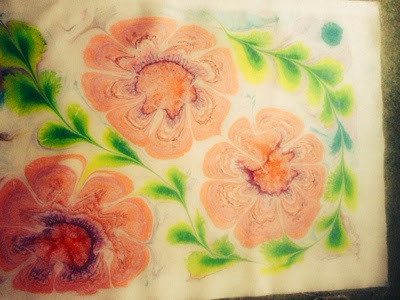 Take a look at some of the wonderful machine embroidered flowers that the lovely ladies made on their residential at Alston Hall. Preston over this weekend. This entry was posted in Uncategorised on 8th June 2014 by Kathleen. 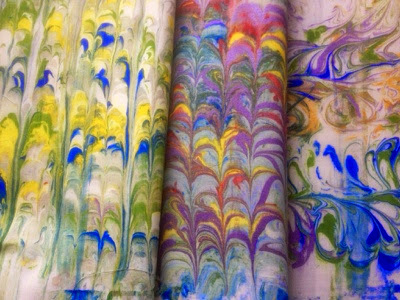 This entry was posted in Marbling Fabric, Uncategorised on 8th June 2014 by Kathleen. 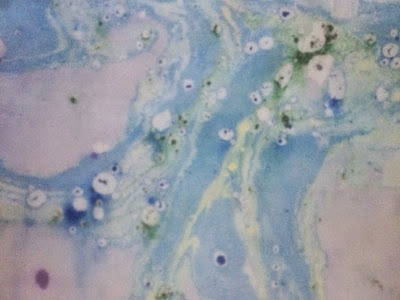 Today I played with floating marbling inks and paint on proper liquid size which I had to make up. 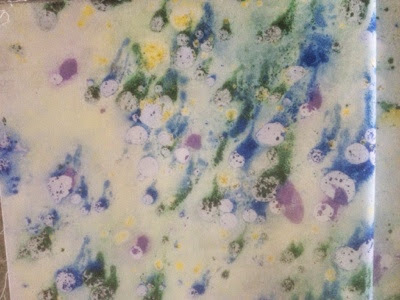 This technique is quite different from marbling using shaving foam and wonderful flowers and leaves can be achieved with a little practice as well as all the other general marbling patterns. I used Deka marble medium and Methocel. They both worked but the Deka medium was easier to use and didn’t stink the house out like the Methocel did. I would now use the Deka marble medium in preference as it also makes up smaller amounts and therefore is not as wasteful. I also worked on to Indian cotton because I fancy making a quilt at some point but any fabrics or paper etc can be used. 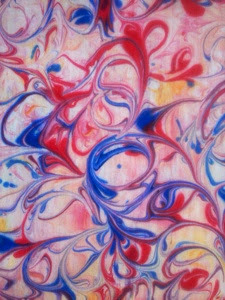 This entry was posted in Marbling Fabric, Uncategorised on 1st June 2014 by Kathleen. 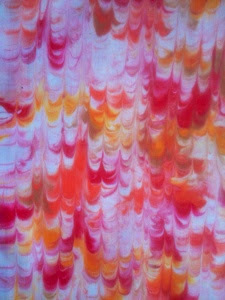 This is my second go at marbling using hubbies shaving foam and I must say I’m very Pleased with the results. Okay I can’t get some of the traditional designs because in this technique the paints don’t float on the surface as they do with traditional size. But. 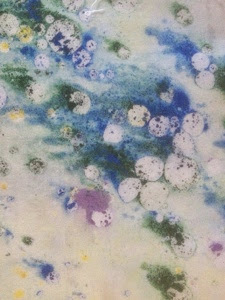 Wow it’s so easy that I can go without the hassle of the traditional method or I can do the basics this way and get the others by going to the effort of mixing the seaweed size to float my paints. 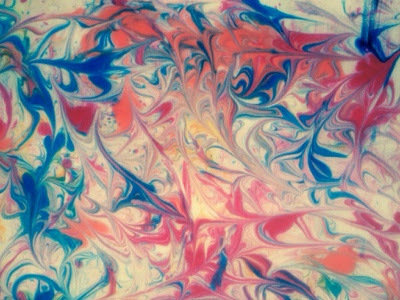 This entry was posted in Marbling Fabric, Uncategorised on 26th May 2014 by Kathleen. 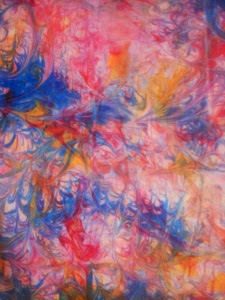 This whole marbling of fabrics has really got me hooked. It’s exiting and frustrating all at the same time. 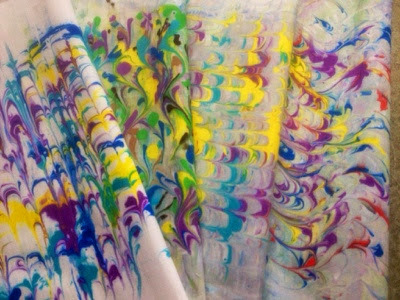 Yesterday I played with the Easy Marabu marbling paints which say they are for fabrics until you read the small print where it tells you they can’t be washed ( this just made me cross) as that was why I had spent time playing with them . I packed them away at this point as they were messy and I could feel my patience going. I sat for a while with mum and we brain stormed over the technique, finally coming up with mixing acrylic paint with cooking oil. Our theory being that the oil would float on the water and hold the paint. 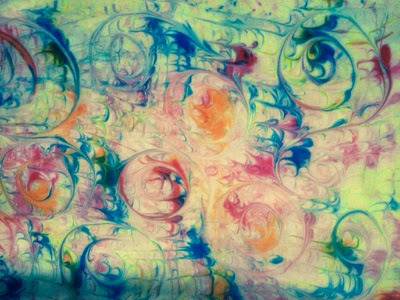 This produced wonderful bubble effects within the marbling that I really liked. The only thing was that I couldn’t comb through the water because the droplets of oil didn’t drag on the surface. As the comb went though them they just separated into more globules of oil. 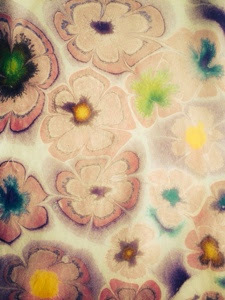 I laid my fabric over the tray and loved the captured result. The fabric was then laid on to brown paper to soak up some of the oil before being ironed between brown paper to soak up and remove remaining oil and set the acrylic paint to the fabric. I then washed it in hottish water and fairy liquid to make sure any lingering oil came out and that the paint had fixed firmly to the fabric. Wow what fun. I really was quite hoping this was going to be a disaster, just because it was so easy to do. Well I was dead impressed with the technique and my students next week will be too. It was quick, easy, not to messy and the results were good. 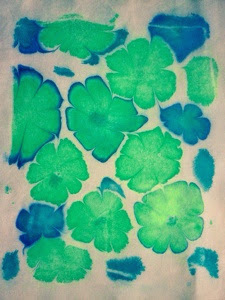 I used Dylon fabric paints and normal acrylics to try it out and both were very successful . I even bunged them in the washing machine to check that they did remain permanent, which they did. 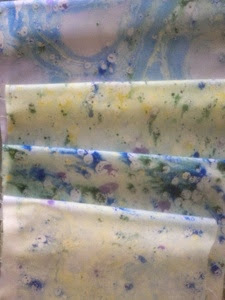 Tomorrow I will try them on wall paper paste and traditional size. 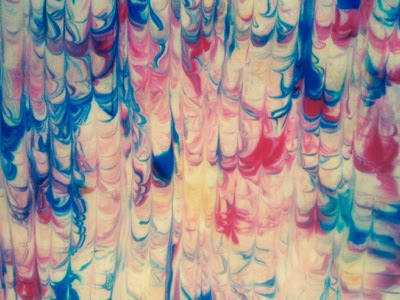 This entry was posted in Marbling Fabric, Uncategorised on 24th May 2014 by Kathleen.